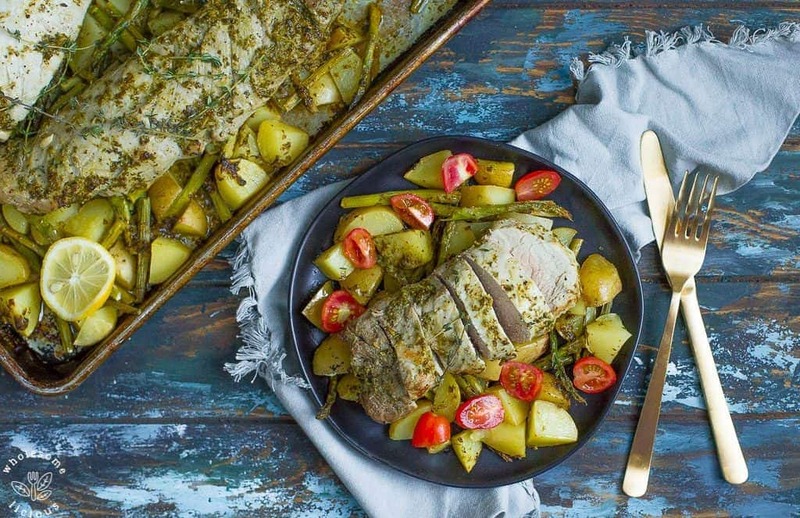 Perfectly roasted pork tenderloin over a bed of vegetables and dressed with a delicious lemon dairy-free pesto! This simple dinner can be cooked in less than 30 minutes, and makes an easy weeknight dinner. 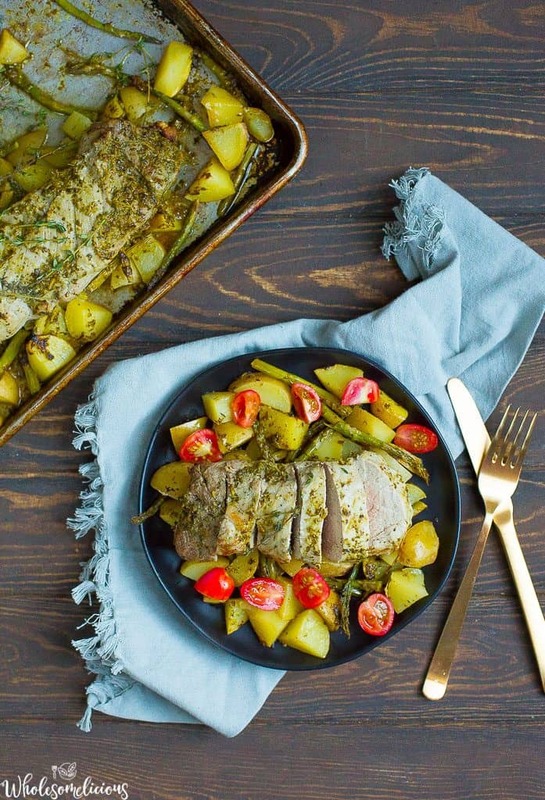 If you struggle with what to feed your family on a busy weeknight, and want to try your hand at a roasted dish in the oven, allow me to introduce you to this pork tenderloin. For years, I avoided this cut of meat. I am a chicken, vegetarian, or beef girl, and rarely stray to anything else. 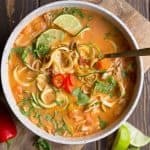 But in an effort to please my pork loving children and husband, I’ve branched out to try new ways to make this meat taste absolutely delicious! You really can’t go wrong with pesto anything, at least according to my family. Garlic and basil are top on the list of flavor combos for my kids; they are obsessed and are excited when I mention anything pesto for dinner! 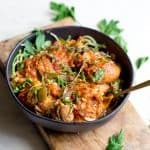 This variation of pesto is dairy-free to make it Paleo and Whole30 compliant, but feel free to add in some parmesan. 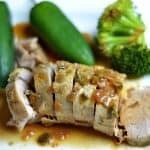 I’ve also decided I need more pork tenderloin recipes on my site, ASAP. They are slowly becoming one of my cuts of meat because they have this tender and juicy texture compared to chicken, and also hold flavor so much better. 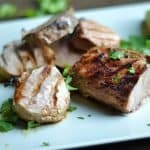 Whether it’s in the Instant Pot, slow cooker, grill, or sheet pan, I am thoroughly loving cooking and eating everything pork tenderloin! 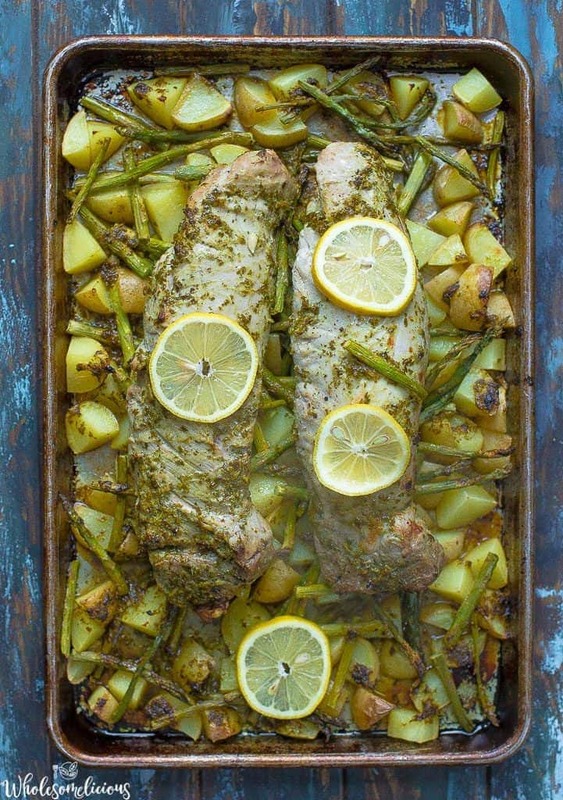 This was all baked together with asparagus, and yukon gold potatoes for a complete meal. 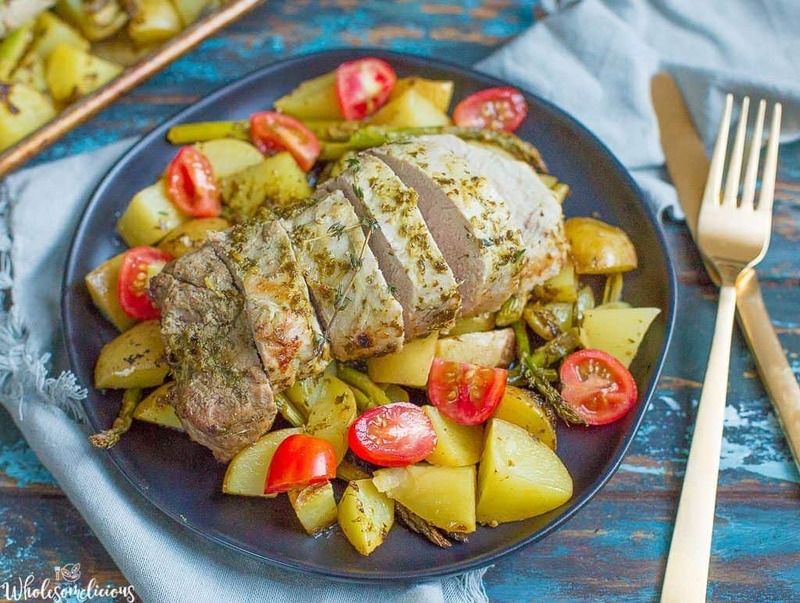 The pork roasts perfectly on top of the veggies and gives the veggies plenty of flavor! All baked in less than 30 minutes for an easy dinner. Preheat oven to 450 degrees and ensure you have a rack positioned in the center of the oven. 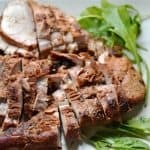 Prepare your pork by trimming off the fat, you should have 2 lb pieces of pork tenderloin. Sprinkle with salt and pepper, set aside. Now make your sauce: in a food processor, pulse oil, lemon juice, basil, lemon zest, garlic, and salt. Line a baking sheet with foil, or spray with non-stick spray. Chop up your potatoes (leaving skin on for more nutrients), into small chunks. Also, cut your asparagus spears into 2 inch pieces. 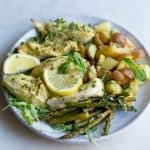 Spread both potatoes and asparagus over your baking sheet. Spoon or brush 2 tbsp of the pesto sauce over the vegetables, sprinkle with salt and pepper. Take the remaining pesto sauce and rub over both of the tenderloins. 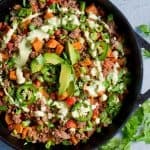 Place the tenderloins on top of the vegetables on the sheet pan. Roast the pork and vegetables for 15 minute, then use kitchen tongs to flip the tenderloins over. Continue to roast until the vegetables are browned and the thickest part of the pork tenderloin reaches 145 degrees. This will take an additional 10-15 minutes. Allow the pork to rest for at least 10 minutes covered in foil before transferring to a cutting board to slice. Serve with vegetables. Looks so delicious and beautiful…would be great for dinner!! Quick and awesome! I made extra pesto to put on the pork after it was done. I think I’m going to try it with green beans instead of asparagus. They shouldn’t cook too fast, should they?